Whether you’re tracking, mixing, or just listening to music, your headphone amplifier is as important to the final sound quality as your headphones – yet the world is full of headphone amps with compromised sonics, headroom, and power. For much equipment, the headphone output is an afterthought. 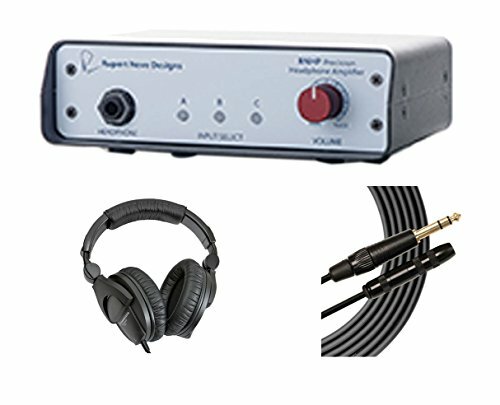 Most products with integrated headphone amps have large feature sets, small footprints, and relatively low price points. This leads to comprised power and audio quality of the headphone amplifier itself, which can lead to a number of issues in real world usages such as low headroom, unreliable performance, and a lack of focus. In addition to being able to drive a wide variety of headphones without sacrificing performance, the RNHP is also capable of receiving a wide array of signals with its 3 inputs, calibrated for optimum level and impedance. Check the Application notes for how the RNHP can be utilized for different purposes. The HD 280 Pro is Sennheiser's most significant closed, circumaural headphone to be introduced in years. Designed to exceed the demands of the professional environment, the HD 280 Pro boasts extremely robust construction combined with extensive features that meet the requirements of today's most demanding applications. If you have any questions about this product by Rupert Neve Designs, contact us by completing and submitting the form below. If you are looking for a specif part number, please include it with your message.